The Android OS provides extensive support for multimedia, encompassing both audio and video. This guide focuses on audio in Android and covers playing and recording audio using the built-in audio player and recorder classes, as well as the low-level audio API. It also covers working with Audio events broadcast by other applications, so that developers can build well-behaved applications. Modern mobile devices have adopted functionality that formerly would have required dedicated pieces of equipment – cameras, music players and video recorders. Because of this, multimedia frameworks have become a first-class feature in mobile APIs. Playing Audio with MediaPlayer – Using the built-in MediaPlayer class to play audio, including local audio files and streamed audio files with the AudioTrack class. Recording Audio – Using the built-in MediaRecorder class to record audio. Working with Audio Notifications – Using audio notifications to create well-behaved applications that respond correctly to events (such as incoming phone calls) by suspending or canceling their audio outputs. Working with Low-Level Audio – Playing audio using the AudioTrack class by writing directly to memory buffers. Recording audio using the AudioRecord class and reading directly from memory buffers. This guide requires Android 2.0 (API level 5) or higher. Please note that debugging audio on Android must be done on a device. The simplest way to play audio in Android is with the built-in MediaPlayer class. MediaPlayer can play either local or remote files by passing in the file path. However, MediaPlayer is very state-sensitive and calling one of its methods in the wrong state will cause an exception to be thrown. It's important to interact with MediaPlayer in the order described below to avoid errors. Instantiate a new MediaPlayer object. Configure the file to play via the SetDataSource method. Call the Prepare method to initialize the player. Call the Start method to start the audio playing. The corollary to MediaPlayer for recording audio in Android is the MediaRecorder class. Like the MediaPlayer, it is state-sensitive and transitions through several states to get to the point where it can start recording. 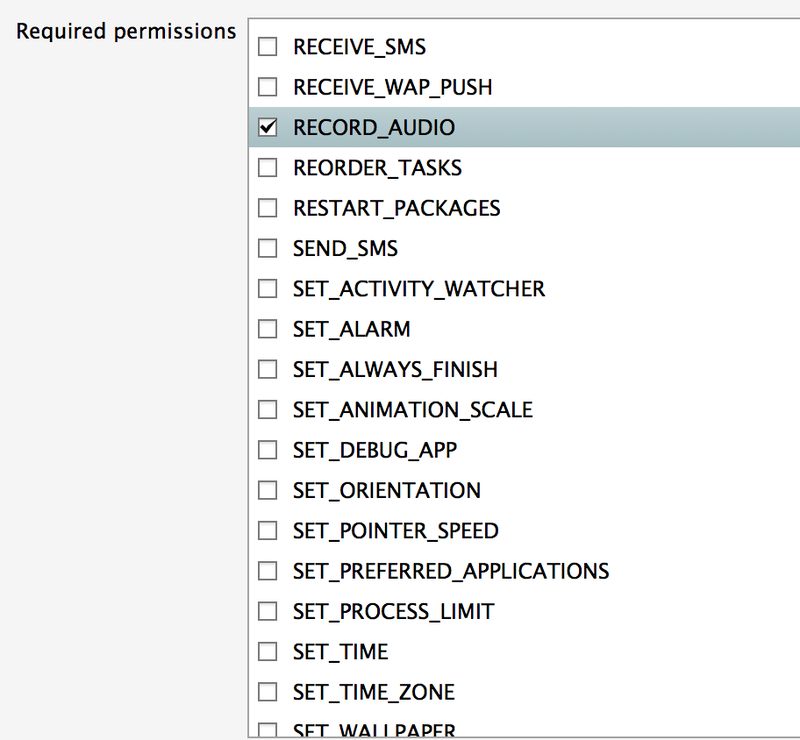 In order to record audio, the RECORD_AUDIO permission must be set. For instructions on how to set application permissions see Working with AndroidManifest.xml. Instantiate a new MediaRecorder object. Specify which hardware device to use to capture the audio input via the SetAudioSource method. Set the output file audio format using the SetOutputFormat method. For a list of supported audio types see Android Supported Media Formats. Call the SetAudioEncoder method to set the audio encoding type. Call the SetOutputFile method to specify the name of the output file that the audio data is written to. Call the Prepare method to initialize the recorder. Call the Start method to start recording. recorder = new MediaRecorder (); // Initial state. recorder.Start (); // Recording state. The AudioManager class provides access to audio notifications that let applications know when audio events occur. This service also provides access to other audio features, such as volume and ringer mode control. The AudioManager allows an application to handle audio notifications to control audio playback. The audio resources of the device (the built-in player and recorder) are shared by all running applications. Conceptually, this is similar to applications on a desktop computer where only one application has the keyboard focus: after selecting one of the running applications by mouse-clicking it, the keyboard input goes only to that application. Audio focus is a similar idea and prevents more than one application from playing or recording audio at the same time. It is more complicated than keyboard focus because it is voluntary – the application can ignore that fact that it does not currently have audio focus and play regardless – and because there are different types of audio focus that can be requested. For example, if the requestor is only expected to play audio for a very short time, it may request transient focus. Audio focus may be granted immediately, or initially denied and granted later. For example, if an application requests audio focus during a phone call, it will be denied, but focus may well be granted once the phone call is finished. In this case, a listener is registered in order to respond accordingly if audio focus is taken away. Requesting audio focus is used to determine whether or not it is OK to play or record audio. For more information about audio focus, see Managing Audio Focus. Registering the FocusChangeListener callback from the IOnAudioChangeListener is an important part of obtaining and releasing audio focus. This is because the granting of audio focus may be deferred until a later time. For example, an application may request to play music while there is a phone call in progress. Audio focus will not be granted until the phone call is finished. For this reason, the callback object is passed as a parameter into the GetAudioFocus method of the AudioManager, and it is this call that registers the callback. If audio focus is initially denied but later granted, the application is informed by invoking OnAudioFocusChange on the callback. The same method is used to tell the application that audio focus is being taken away. When the application has finished using the audio resources, it calls the AbandonFocus method of the AudioManager, and again passes in the callback. This deregisters the callback and releases the audio resources, so that other applications may obtain audio focus. Obtain a handle to the AudioManager system service. Create an instance of the callback class. Request the audio resources of the device by calling the RequestAudioFocus method on the AudioManager . The parameters are the callback object, the stream type (music, voice call, ring etc.) and the type of the access right being requested (the audio resources can be requested momentarily or for an indefinite period, for example). If the request is granted, the playMusic method is invoked immediately, and the audio starts to play back. If the request is denied, no further action is taken. In this case, the audio will only play if the request is granted at a later time. When the playback of the track is complete, the AbandonFocus method on AudioManager is invoked. This allows another application to gain the audio resources of the device. Other applications will receive a notification of this audio focus change if they have registered their own listeners. When playing from encrypted audio files. When playing a succession of short clips. The AudioTrack class uses the low-level audio APIs for recording, and is the low-level equivalent of the MediaPlayer class. Stream type – Voice, ringtone, music, system or alarm. Frequency – The sampling rate expressed in Hz. Channel Configuration – Mono or stereo. Audio format – 8 bit or 16 bit encoding. Buffer size – in bytes. Buffer mode – streaming or static. // Length of the audio clip. // Mode. Stream or static. The AudioRecord class is the equivalent of AudioTrack on the recording side. Like AudioTrack, it uses memory buffers directly, in place of files and URIs. It requires that the RECORD_AUDIO permission be set in the manifest. Hardware audio input source such as microphone. Once the AudioRecord is constructed, its StartRecording method is invoked. It is now ready to begin recording. The AudioRecord continuously reads the audio buffer for input, and writes this input out to an audio file. // Hardware source of recording. // Keep reading the buffer while there is audio input. // Write out the audio file. The Android OS provides a powerful framework for playing, recording and managing audio. This article covered how to play and record audio using the high-level MediaPlayer and MediaRecorder classes. Next, it explored how to use audio notifications to share the audio resources of the device between different applications. Finally, it dealt with how to playback and record audio using the low-level APIs, which interface directly with memory buffers.